How Much Does it Cost To Fly To New York? The cheapest flights to New York found within the past 7 days were $81. Prices and availability subject to change. Additional terms may apply. As author Thomas Wolfe once observed, “One belongs to New York instantly. One belongs to it as much in five minutes as in five years.” From the moment you step off the plane in NYC, the city absorbs you into its frenetic energy and cacophony of noise. An urban melody of honking horns, talking crosswalks, and distant sirens fills your ears. Welcome to the City that Never Sleeps. It’s not just the promise of an exciting concrete jungle that draws people to NYC like a magnet. The food, art, and theater are known around the world and bring in everyone from epicurean experts to gallery gurus. Choose from one of our New York City flights today, and soon you’ll be rubbing elbows with travelers from around the world and bold New Yorkers alike. Booking flights to New York City is easy; Travelocity has options from many major cities. When your plane touches the tarmac, you’re just minutes from a New York slice of pizza and some of the top hotels on the East Coast. NYC is well-serviced by a robust public transportation system, so you can get from John F. Kennedy International Airport (JFK) or LaGuardia Airport (LGA) to your favorite borough via subway or commuter rail. You can also hop into a cab and head straight for your destination. Having a rental car is not only unnecessary, but it might actually be a burden in particularly congested places like Manhattan. If you plan on staying on the island of Manhattan for most of your stay, become acquainted with the subway. If you plan to explore the outer boroughs or venture on to upstate New York, book a rental car at the same time you buy plane tickets to New York City and save some cash. New York Marriott Marquis: Set in the heart of the Theater District, you’ll be humming show tunes if you stay at the New York Marriott Marquis. Enjoy a sunset from the hotel’s “Broadway Terrace” and overlook the bright signs and cheerful crowds of the famed stretch of theaters. 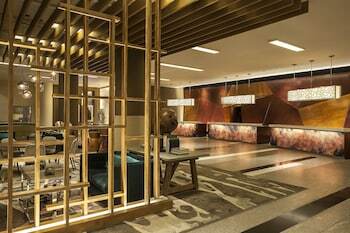 DoubleTree Suites by Hilton New York City - Times Square: When you want to stay in the pulse of NYC, there is no place like Times Square. You’ll be within walking distance of Radio City Music Hall, Carnegie Hall, and more restaurants than you can shake a food cart hot dog at. 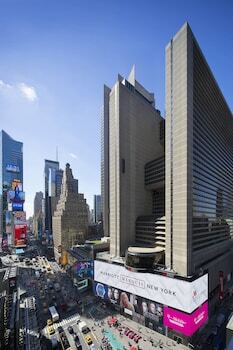 New York Hilton Midtown: Walk to Central Park and MOMA when you stay at this Midtown Hotel. At the end of your day of exploration, you’ll return to your hotel to be greeted by an ornate lobby and huge fitness center. Flights to NYC take your breath away; as you descend into the beloved city, the skyline is as iconic as it appears in the movies. Once you put your bags down at the hotel, you’re off to see the Statue of Liberty in person and tour the Metropolitan Museum of Art. When you need a breath of fresh air, Central Park awaits with its emerald tree cover and expansive lawns. Cap off your day with a meal at the One World Trade Center building or tickets to a Broadway show. NYC flights are just the beginning. Once you’re in the City that Never Sleeps, your senses remain alive and delighted until you leave. Book your airfare to New York today, and soon you’ll be draped in the neon lights of Times Square. Question : Where can I find cheap flights to New York? Answer : We know you’re looking for the best flights at the lowest fares, so we found some of the sweetest deals in town just for you. Check out the top flight deals to New York. Act quickly and score yourself a bargain! Spirit Airlines has a flight from to New York departing on 5/3/19 and returning on 5/6/19 all for only $133.00 per person. * Book these Spirit Airlines flights! Delta has a flight from to New York departing on 4/30/19 and returning on 5/3/19 all for only $140.00 per person. * Book these Delta flights! American Airlines has a flight from to New York departing on 5/18/19 and returning on 5/20/19 all for only $148.00 per person. * Book these American Airlines flights! Question : What are the most popular airlines that fly to New York? Delta Air Lines Flies 921 flight per week between and New York. United Airlines Flies 815 flights per week between and New York. American Airlines Flies 661 flight per week between and New York. 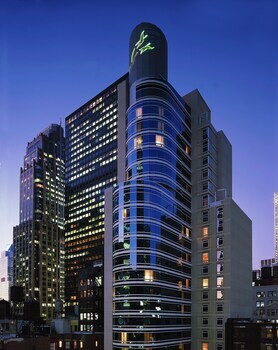 Question : Which hotels are located near airports or major attractions in New York? 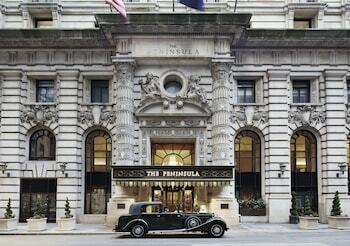 Answer : We've put together a list of hotels in New York close to airports and popular sights to see. Check out the hotels below. 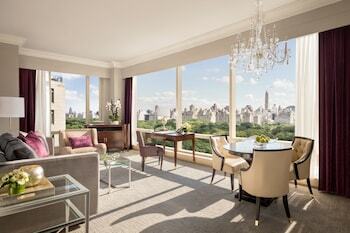 All of them are within proximity to must-see attractions and major airports in and around the city of New York. The Roosevelt Hotel- New York City: Located at the corner of East 45th Street and Madison Avenue, the Roosevelt Hotel, New York City, provides ready access to shopping, as well as Broadway theaters, 3 blocks away. This hotel has a 4.00 star rating. The Belvedere Hotel: This New York hotel is in the center of all the action, located in the cluster of Broadway theaters. The center of Times Square is 2 blocks away, and Rockefeller Center is a 3-block walk. This hotel has a 3.50 star rating. Hotel Edison: Located in Theatre District, this hotel is within a 10-minute walk of Broadway, Times Square, and Ed Sullivan Theater. Rockefeller Center and Macy's are also within 15 minutes. This hotel has a 3.00 star rating. 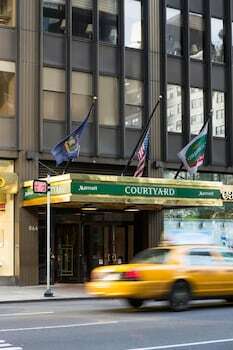 Stewart Hotel: Manhattan NYC-an Affinia hotel is located in the city's bustling Midtown. Madison Square Garden and Penn Station are across the street, and Times Square - the hub of the Broadway Theater District - is a 15-minute walk. Top-of-the-world views from the Empi This hotel has a 4.00 star rating. Question : What are the top attractions in New York? Answer : New York has over 346 points of interest for you to choose from. We suggest checking out Long Beach and Times Square first because they are the most popular attractions in New York. Don't forget about other highly recommended spots like Central Park, Canal Park, and Lincoln Park. Get out there and see what the city has to offer on your trip to New York! Staff was friendly and very helpful. Our recently updated double room was well laid out and designed. The concierge even found us affordable tickets for Hamilton with only one day notice.